by Cook, Alexandra P., Cook, Noble D.
Cook, Alexandra P., Cook, Noble D.
Good Faith and Truthful Ignoranceuncovers from history the fascinating and strange story of Spanish explorer Francisco Noguerol de Ulloa. in 1556, accompanied by his second wife, Francisco returned to his home in Spain after a profitable twenty-year sojourn in the new world of Peru. However, unlike most other rich conquistadoreswho returned to the land of their birth, Francisco was not allowed to settle into a life of leisure. Instead, he was charged with bigamy and illegal shipment of silver, was arrested and imprisoned. Francisco’s first wife (thought long dead) had filed suit in Spain against her renegade husband. So begins the labyrinthine legal tale and engrossing drama of an explorer and his two wives, skillfully reconstructed through the expert and original archival research of Alexandra Parma Cook and Noble David Cook. 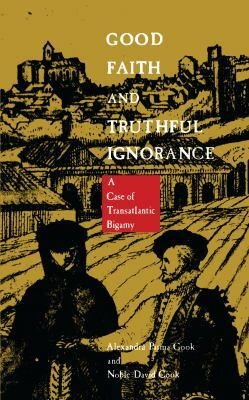 Drawing on the remarkable records from the trial, the narrative of Francisco’s adventures provides a window into daily life in sixteenth-century Spain, as well as the mentalit and experience of conquest and settlement of the New World. Told from the point of view of the conquerors, Francisco’s story reveals not only the lives of the middle class and minor nobility but also much about those at the lower rungs of the social order and relations between the sexes. In the tradition of Carlo Ginzberg’s The Cheese and the Wormsand Natalie Zemon Davis’ The Return of Martin Guerre, Good Faith and Truthful Ignoranceilluminates an historical period-the world of sixteenth-century Spain andPeru-through the wonderful and unusual story of one man and his two wives.Cook, Alexandra P. is the author of 'Good Faith and Truthful Ignorance A Case of Trans-Atlantic Bigamy' with ISBN 9780822312222 and ISBN 0822312220.